Chicken breasts with sweet potatoes and broccoli may not be anything new, but the way in which our chefs have dressed them up certainly is. 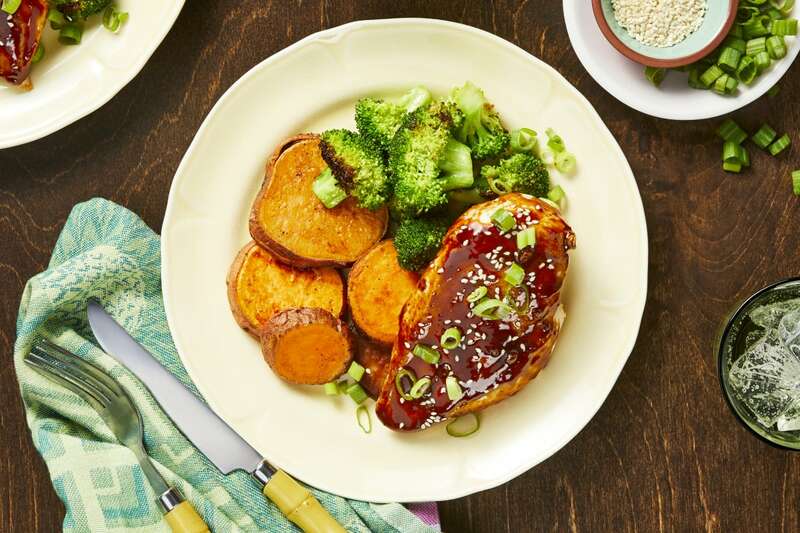 In this twist on your classic protein, starch, and veg, a hoisin sriracha glaze is used to add a layer of sweet, Asian-style flavor to the meat. Then the broccoli on the side is tossed with ginger to give it extra zing. The sweet potatoes, however, are already a powerhouse and are simply roasted to let them shine. Preheat oven to 450 degrees and adjust racks to middle and upper positions. Wash and dry all produce. Peel and mince ginger until you have 2 TBSP. Trim, then thinly slice scallions, separating whites from greens. Slice sweet potatoes into ¼-inch-thick rounds. Cut broccoli florets into bitesized pieces. Toss broccoli on a baking sheet with a drizzle of oil, salt, and pepper. 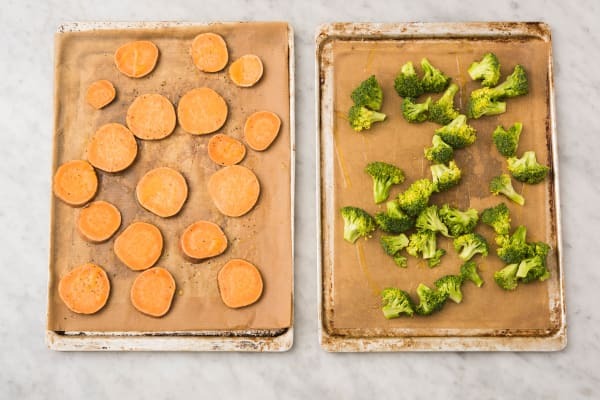 Toss sweet potatoes on a second baking sheet with a drizzle of oil, salt, and pepper. Roast sweet potatoes on upper rack and broccoli on middle rack of oven until tender, 20-25 minutes total (we’ll check on everything halfway through). Pat chicken dry with paper towels; season all over with salt and pepper. Heat a drizzle of oil in a medium pan over medium-high heat. Add chicken and cook until browned and cooked through, 4-7 minutes per side. Turn off heat; remove from pan and set aside. Meanwhile, in a small bowl, stir together hoisin, sriracha, honey, and 2 TBSP water and set aside. 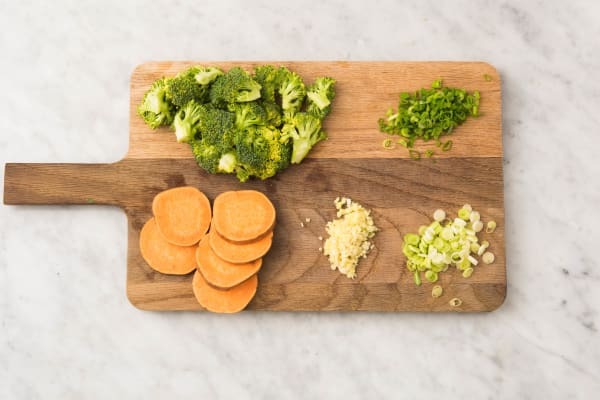 Once broccoli and sweet potatoes have roasted 10-12 minutes, remove from oven. Flip sweet potatoes. Toss broccoli with half the minced ginger and a drizzle of oil. Continue roasting until both veggies are tender, 10-15 minutes. Heat a drizzle of oil in same pan used to cook chicken over medium-high heat. Add scallion whites and remaining minced ginger. Cook, stirring, until softened and fragrant, 2-3 minutes. 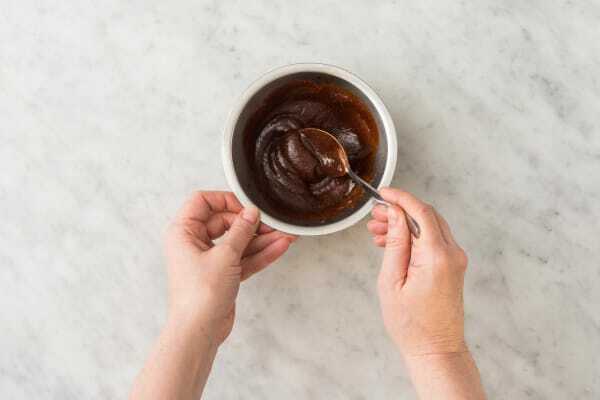 Stir in hoisin mixture and bring to a gentle simmer. Season with salt and pepper. 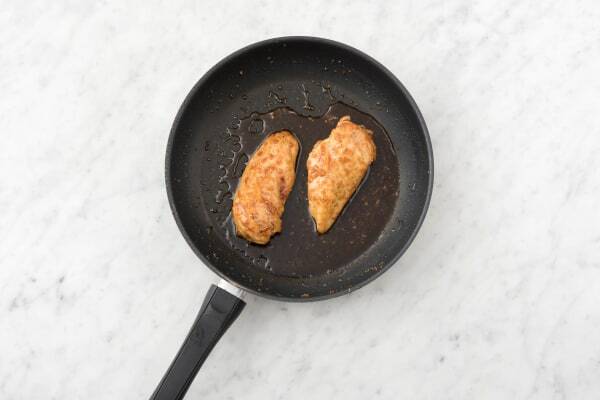 Return chicken to pan and turn to coat in glaze. Turn off heat. Divide chicken between plates. Drizzle with any remaining glaze in pan and sprinkle with sesame seeds and scallion greens. 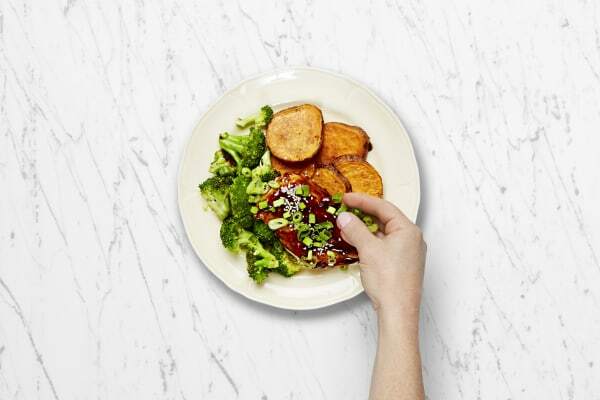 Serve with sweet potatoes and broccoli on the side.